Modifying Staff Roles to go beyond Administrator and Moderator? We just got discourse for our new website and were wondering if there was a way to create other staff positions with different permissions besides Administrator and Moderator. i.e: Super Moderator; Super Administrator; etc. If not then whatever, not the end of the world, but it would be nice considering the original plan for the forum that we were going to implement. What are the 'Private spaces'? What difference with 'Categories'? What would the difference be between these roles? What is the purpose of these roles? Because of the type of organization that we will be running (I’d love to elaborate, but it’s still in fetus stage), we would prefer to have specific permissions dependent upon the people we have. “SuperAdmin” will only be me, the one who manages the forum, and the president of the organization. “Administrator” would be for a few close and trustworthy “friends” in the organization. “SuperMods” are all the other people that work for the organization. “Moderators” are some few people on the forum that are “Community Ambassadors” basically. Again, not necessary, but it would make the flow of at least our forum work better. Is there any (hopefully not painful) way to manage new roles and positions by modifying the source files, or would that be too “dangerous” to do on our own? EDIT: Sorry, I realized that giving a random “Community Ambassador” (Mod) the ability to abolish threads at the click of a finger was a little obscene, lol. Modified it a bit. I feel there needs to be something in between Admin & Moderator. The biggest area of concern would be groups. Right now, only admins can create groups. Then can add group owners, who get more privileges, but they have to do that to start off. Depending on the size of staff, there might be one admin and lots of moderators, but that one admin needs to do everything involving groups. Another potential feature for an “in-between” staff person would be access to certain site-settings. Not being an admin, I don’t know all of them but adjusting things like plugins, and site limits, and more would be nice. Features that I do not think should be given to this “io-between” staff member would be any site-setting that could drastically affect the Discourse, CSS edits, and viewing of all PMs. Looks like much of what you are asking is possible already. category-specific moderation is in the works. Also note that discourse has several flavors of user. See What do user trust levels do? 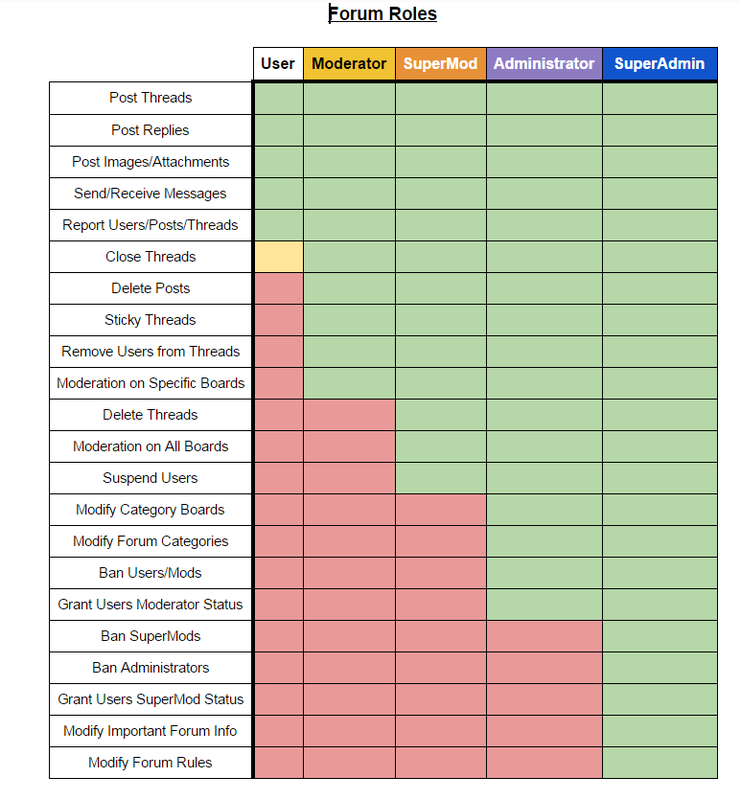 “Ban super mods” & “Ban admin” should be just a matter of removing admin status and then doing what is necessary about the user account, not really separate tasks in themselves. Hello, sorry if my english is bad. I recently installed Discourse Assign plugin and realized that topics can only be assigned to staff members. I understand that only moderators and administrators are members of the staff group, but i do need to assign some public topics to people with less permissions than a moderator, this can’t be done with TL4 users. That would be something to be fixed in the assign plugin; I don’t think core needs more “staff” types just to allow topic assignment to a wider range of people. Yes, I wasn’t sure where to put it. Thanks. Do I have to say this in the assign plugin topic or is not necessary? Yes, you should discuss that in an appropriate topic.